To add a new store you have to be running XpertMart™ 's Multi-Store Edition. If you have been using the Single Store Edition and want to add more stores to your database, contact your Authorized Dealer for help. Your database will first have to be split into a Main station and a Remote station . Once the Authorized Dealer has split your database you can add additional Remote stations. When you are ready to add a new store to your XpertMart ™ database, you will have to change the configuration at both the Main and at the new Remote . 1) Enter a new Hasp code by going to File>System>Apply Hasp Code . The Hasp code contains, among other things, instructions to the Main on how many Remote stations are allowed. Your Authorized Dealer will give you the new code to enter. 2) Change the configuration at the Main to add another store. Go to Configure>Add a Store and follow the prompts to add another store. 3) Add a new entry to the Stores Catalog. Press the New Record button in the toolbar at the top of the catalog and fill in the information for the new store. 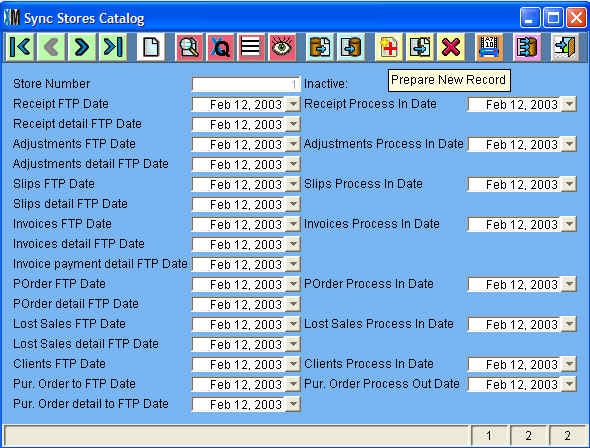 The Store Code you enter is what's displayed in the Stores column of the XpertMatrix™ . The address, phone number and email will print on your Invoices . 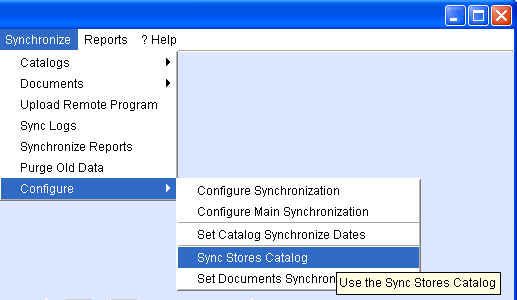 4) Add a store to the Sync Stores Catalog by going to Syncrhonize>Configure>Sync Stores Catalog. This will open up the Sync Stores Catalog. 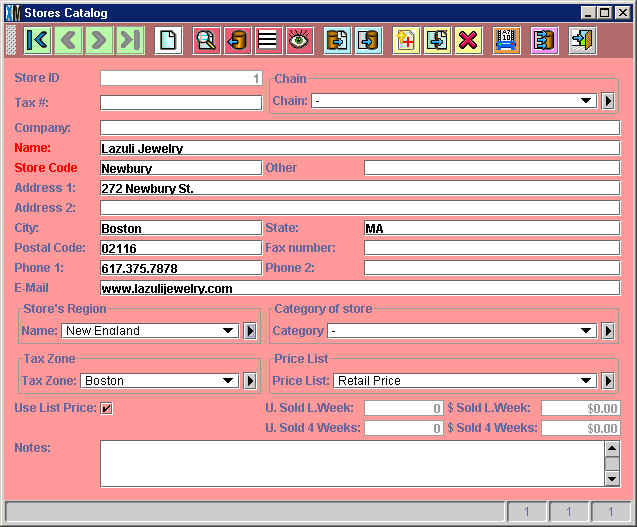 Use the New Record button in the toolbar to add a new entry in the catalog. Make sure the number of stores in the Sync Stores Catalog (as shown by the Records Bar in the bottom left-hand corner) matches the number of stores in the Stores Catalog. 5) Finally, when you are ready to start synchronizing data between the Main and the new store, you will need to configure the synchronization dates in the new store with today's date, so it doesn't try to send all information since January 1, 1970, only information from this day forward. You do this at: Synchronize>Configure>Set Document Synchronization Dates and Synchronize>Configure>Set Catalog Synchronization Dates. This is covered in the Synchronization chapter. 1) Start with a blank database. There is a blank Main.gdb file on the XpertMart™ Install CD. If you don't have it handy, contact you Authorized Dealer who can email you one. 2) Go to Configure>Store Configure and enter the correct Store Number. Store Number are assigned sequentially, so if this is the second store you are adding then the Store Number would be 2. (The Main station is considered Store 0). This tells the program that this remote is now Store_ID =2. Make sure you are entering the right number by double-checking the Store Number shown in the Stores Catalog . Exit XpertMart™ for the change to take effect. 3) Configure the Synchronization . Under the Synchronization menu, go to Configure>Configure Synchronization. Under the FTP tab, enter the address, user name and password for the FTP Server you will be using. 4) Make sure the computer at the new store an connect to the Internet. 4) Manually Initialize Catalogs at the Main. At the store, go to Synchronize>Catalogs>Download Catalog Initialization. Wait for this to finish. Then go to Synchronize>Catalogs>Initialize Catalogs. When this is done you should be able to open any catalog and see your data. 5) Set the Document Synchronization Dates . You need to do this both at the new store and in the Sync Stores Catalog at the Main. Enter the date you first opened the new store. Otherwise XpertMart ™ will create synchronization files for every date since January 1, 1970! 6) You can now either manually do a synchronization to make sure everything is working okay or just leave it Scheduled and check in on it the following day. The next chapter explains how to use synchronization to send new software versions and reports out to stores.